Be the first to share your favorite memory, photo or story of Tommy . This memorial page is dedicated for family, friends and future generations to celebrate the life of their loved one. Tommy Lee Howard, 76, husband of Annette Ard Howard, passed away Thursday, September 27, 2018, at his residence. Mr. Howard was born in Andrews on February 2, 1942, a son of the late Louis Javel Howard and Lottie Mae Moore Howard. Tommy grew up in Andrews and graduated from Andrews High School. 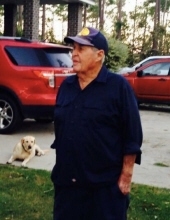 He was owner and operator of Howard Timber Corporation and a member of the South Carolina Timber Producers Association. Tommy’s main goal and hobby in life was always to be a logging man. He was well known and loved in the Andrews area and in the logging industry. In addition to his parents, Tommy is predeceased by; a brother, Clarence Howard. Surviving are: his wife of Andrews; two daughters, Lisa Howard Thompson (Mark) of Andrews; and Deborah Howard Antley (Gene) of Lexington; four grandchildren; Josh Thompson (Miranda); Jodi Thompson, and Marina and Reilly Pitts; two great-grandchildren; Liam and Bentlee Thompson; and a sister, Marjorie Howard Foley (Larry) of St. Paul, NC. Funeral Services will be two o’clock Sunday, September 30, 2018 in Happy Home Original Free Will Baptist Church. Burial will follow in Andrews Memorial Cemetery. The family will receive friends Saturday evening, September 29, 2018, from six until eight o’clock in the Andrews Chapel of Mayer Funeral Home. To send flowers or a remembrance gift to the family of Tommy Lee Howard, please visit our Tribute Store. "Email Address" would like to share the life celebration of Tommy Lee Howard. Click on the "link" to go to share a favorite memory or leave a condolence message for the family.